As summer draws to close and we begin to think about Pumpkin Spiced Lattes there is one drink I refuse to give up just because the temperature changes. Ice Tea. I’m not referring to everyone’s favorite sweet tea, I’m referring to my own ice tea concoctions. They are great alternatives to sweet tea. In an effort to kick the Coca Cola habit and lessen the amount of sugar in my drinks, I needed to come up with an alternative that was more flavorful than plain water. And there are only so many times in a day when a packet of powdered Propel mixed with water will do. I turned my attention to the stash of tea I had, from white tea to black tea and a host of other flavors there where a lot of teas to play with. I focused on our favorites, Red Zinger, Earl Gray and White tea. 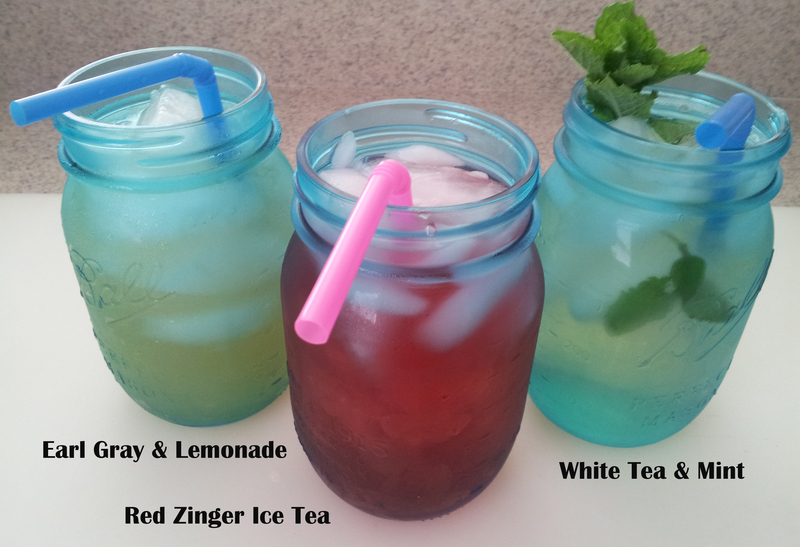 I came up with three fabulous refreshing drinks for any summer day. A long time favorite of mine has been the proverbial Arnold Palmer, half ice tea half lemonade. I changed out the black tea and replaced it with an Earl Gray. Admittedly, I can’t take all the credit- there’s a Sandwich shop that serves this all the time. Make up a glass of white tea and pour it over ice. Add in a sprig of mint and enjoy. You can add sugar to taste, but it’s great without it.